Know exactly how many times to strum each chord before you change. I took out the unnecessary chords and made each song sound amazing and just like the artist would play it! These charts are super simple and easy for everyone to follow along with. The chords are right over the lyrics so you know exactly when to change. Internet charts are FREE and easy to get but they are usually a HOT MESS! Throw these songbooks in your guitar case and always be ready to play with accurate charts. 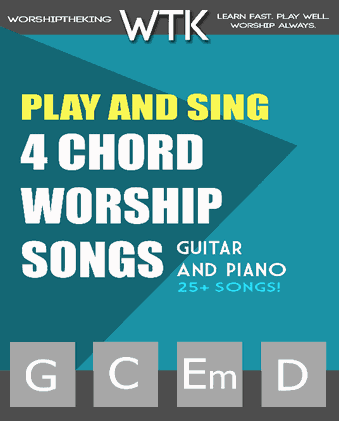 Play the best worship songs with 4 easy modern chords on guitar and piano. Many charts include unnecessary chords that get in the way and make it hard for most musicians to actually sound good playing the song. That is why I have written these simple, accurate, and easy-to-play charts. 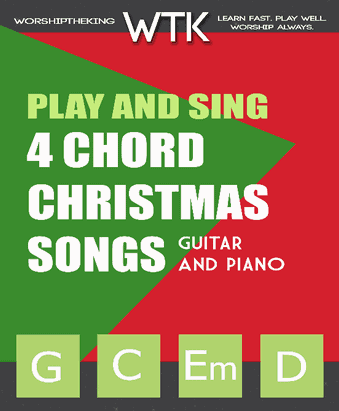 Using my charts, you can play these great songs with 4 simple modern chord shapes on guitar or piano. My simple one-page charts will help you play with ease and help you put more focus on what really matters… worshiping God! Strum along with the SoundCloud playlist! and many other songs of God Family and Faith from the best country artists in the world. You can buy them directly from WTK or from Amazon!